CHAPPAQUIDDICK is one of the best political exposes since the original ALL THE KING’S MEN and FROST V. NIXON. It’s written, directed and produced with a deft, understated clarity about a defining story about the famous Senator Edward “Ted” Kennedy, about which most people know only bits and pieces. Caution is advised for older children. CHAPPAQUIDDICK is one of the best political exposes since the original ALL THE KING’S MEN and FROST V. NIXON. It’s written, directed and produced with a deft, understated clarity about a defining story about the famous Senator Edward “Ted” Kennedy, about which most people know only bits and pieces. The movie opens with an interview of a very low-key Ted Kennedy saying he’s walked in the shadow of his brother, Jack, and his brother, Bobby, all his life. It then takes us back to Ted and his friends traveling by ferry to Martha’s Vineyard for the annual regatta. Ted is accompanied by: Joey, whom he calls his brother and who has been adopted into his family; his lawyer, who fixes things; and, his U.S. Attorney friend, Paul, who’s a good old boy friend of the Kennedy family. Eventually, they head to a beach house where are gathered several of Ted’s political team, who used to work for his deceased brother, Bobby, as well as several young women known as the “boiler room girls,” who are female campaign workers who man the phones and knock on doors. Ted tells them the most important thing in life is family, and they are all family. A shot of a picture of Ted’s father, Joe Kennedy, and his four boys reminds everyone that the heir apparent to the Kennedy political dynasty is Ted. The camera zooms into the picture on Ted, who’s now the only Kennedy left to fulfill his father’s dream of having one of his sons become president. Ted says his brother, Joe, who died in World War II, was a hero, Jack was charismatic, and Bobby was a doer, but he’s always been the least intelligent who makes the most mistakes. Tonight, at this party, he makes the biggest mistake. Although Ted is married to Joan, who’s back at their house in Hyannisport, he takes Mary Jo Kopechne, a pretty young boiler room girl, on a drive to look at the stars. He is very drunk. Coming back from their star-gazing, Ted almost falls asleep at the wheel a few times and eventually drives the car off the Chappaquiddick bridge. Ted escapes the sinking car and must have left the keys inside, locking the doors. So, for the next few hours, Mary Jo tries to keep her head above the water in the air pocket of the car. Instead of reporting the crime at the nearest telephone booth, Ted walks back to the party and gets Joey and Paul to drive back to the scene of the crime. They try haphazardly to open the car doors. Joey keeps telling Ted he needs to report the accident. Instead, Ted heads back to the mainland in a rowboat with them to the hotel where he’s staying. Nine hours pass before Ted reports the crime. During that time, he calls his father and asks him to come up with an alibi. The police chief finds the car, and a scuba diver says they could have opened the car door in minutes and saved Mary Jo if they’d been there sooner. Meanwhile, Paul and Ted pull up to the police chief’s office to invent their alibi. The trouble is, Ted talked to a New York Times reporter, James Reston, as he walked into the police chief’s office. All of the alibi Ted constructs is undermined by the constant egregious mistakes he makes. He seems prone to do everything wrong. He claims he has a concussion and has been prescribed anti-depressants. Reston says the pills would have killed Ted if he had really had a concussion. His father, who’s in a wheelchair and on the verge of death, slaps him and tells Ted he’ll never be great. All Ted can do is try to hug his father, who sees him as a failure. The Kennedy team of Ivy league geniuses come to his aid. Ted tells them he has it under control, and they tell him he can easily be convicted of manslaughter. They also say he has three problems. Everything you said, everything you should have said but didn’t, and everything everyone else will say. So, his Ivy League team conspires to whitewash, spin and overcome the clear evidence that this egotistical, selfish murderer of Mary Jo Kopechne should continue to serve as the senator from Massachusetts. CHAPPAQUIDDICK is fascinating. It starts off very low key setting the stage. However, as soon as the accident happens, the jeopardy and villainy are mesmerizing. There’s not been a movie about political corruption on such a large scale that’s been so well-crafted since ALL THE KING’S MEN, the original 1952 Broderick Crawford version. Also, the meticulous pursuit of the facts is reminiscent of FROST V. NIXON. This movie should be seen by older teenagers and adults, and viewed in every political science, civics and history class in the nation. It has some light 1960s obscenities and a few exclamatory profanities. It also has some nice Christian references and a wonderful funeral scene in a Catholic church. Strong miscellaneous immorality includes the whole story is about conspiring and lying to cover up evidence in a manslaughter case, intentional leaving the scene of a crime, manipulation of evidence, and political corruption and cronyism, but implicitly rebuked. 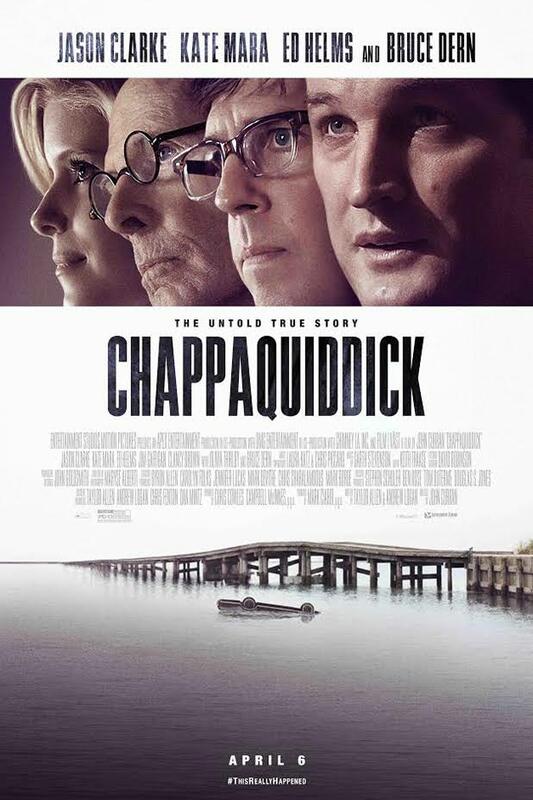 CHAPPAQUIDDICK is about the famous Senator Edward “Ted” Kennedy. Ted and his friends travel to Martha’s Vineyard for the annual regatta in 1969. Eventually, they head to a beach house where several of Ted’s political team, as well as several young female campaign workers who man the phones and knock on doors, are gathered. Although Ted is married to Joan, he takes the pretty Mary Jo Kopechne on a drive to look at the stars. Ted drunkenly drives the car off a bridge into the water and leaves the scene of the accident, where Mary Jo slowly drowns. Ted’s Ivy League team conspires to whitewash, spin and overcome the clear evidence. CHAPPAQUIDDICK is fascinating with mesmerizing jeopardy and villainy. There’s not been a movie about political corruption on such a large scale this well-crafted since the 1952 ALL THE KING’S MEN. This movie should be seen by older teenagers and adults, and viewed in every political science, civics and history class in America. It has some light 1960s obscenities and a few exclamatory profanities. CHAPPAQUIDDICK also has some nice Christian references.